The National Association of Women in Construction (NAWIC) membership means involvement in your career, the construction industry and the community. Through educational events, networking functions and volunteer opportunities here in the Phoenix metropolitan area, our chapter is making a difference. Greater Phoenix Chapter No. 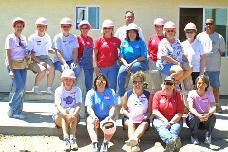 98 is an affiliated chapter of The National Association of Women in Construction, NAWIC. NAWIC has its roots in the organization founded in 1953 in Fort Worth, Texas by sixteen women working in the construction industry. Looking to join us at one of our local NAWIC events? Check our calendar to see our upcoming event dates, times and locations. We host many events throughout the year. Block Kids to attract the youth to careers in construction, our annual bowling tournament to raise funds for educational grants, community outreach activities, NAWIC networking events etc. View the pics we’ve gathered from recent events inside.